The cerebellum uses feedforward processing and modularity to process information. The function of the cerebellum can be described by the principles of feedforward processing and modularity. Feedforward processing means signals move in one direction through the cerebellum, from input to output. Modularity describes the modular nature of the cerebellar system, where modules with similar structures function relatively independently. Modules consist of clusters of neurons with common inputs but distinct outputs. 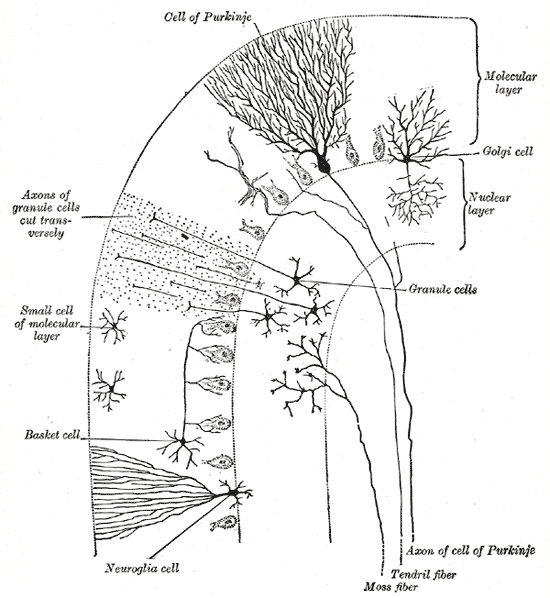 purkinje: Purkinje cells are a class of GABAergic neurons located in the cerebellar cortex. They are some of the largest neurons in the human brain, with an intricately elaborate dendritic arbor characterized by a large number of dendritic spines. feedforward processing: A property of some neural circuits where signals move unidirectionally through the system from input to output, with very little recurrent internal transmission. microzone: A group of Purkinje cells that all have the same somatotopic receptive field. Microzones contain on the order of 1,000 Purkinje cells each, arranged in a long, narrow strip, and oriented perpendicular to the cortical folds. The cerebellum differs from most other parts of the brain in that the signal processing is almost entirely feedforward—that is, signals move unidirectionally through the system from input to output, with very little recurrent internal transmission. The small amount of recurrence that does exist consists of mutual inhibition; there are no mutually excitatory circuits. This feedforward mode of operation means that the cerebellum, in contrast to the cerebral cortex, cannot generate self-sustaining patterns of neural activity. Cells of the Cerebellum: Transverse section of a cerebellar folium, showing its principal cell types and connections. In the human cerebellum, information from 200 million mossy fiber inputs is expanded to 40 billion granule cells, whose parallel fiber outputs then converge onto 15 million Purkinje cells. Because of the way that they are lined up longitudinally, the 1,000 or so Purkinje cells belonging to a microzone may receive input from as many as 100 million parallel fibers and focus their own output down to a group of less than 50 deep nuclear cells. Thus, the cerebellar network receives a modest number of inputs, processes them very extensively through its rigorously structured internal network, and sends out the results via a very limited number of output cells. The cerebellar system is functionally divided into more or less independent modules, that probably number in the hundreds to thousands. All modules have a similar internal structure, but different inputs and outputs. A module (a multizonal microcompartment in the terminology of Apps and Garwicz) consists of a small cluster of neurons in the inferior olivary nucleus, a set of long narrow strips of Purkinje cells in the cerebellar cortex (microzones), and a small cluster of neurons in one of the deep cerebellar nuclei. Different modules share input from mossy fibers and parallel fibers, but in other respects they appear to function independently. The output of one module does not appear to significantly influence the activity of other modules. The synapses between parallel fibers and Purkinje cells, and the synapses between mossy fibers and deep nuclear cells, are both susceptible to modification of their strength. In a single cerebellar module, input from as many as a billion parallel fibers converge onto a group of less than 50 deep nuclear cells, and the influence of each parallel fiber on those nuclear cells is adjustable. This arrangement gives tremendous flexibility for fine-tuning the relationships between the cerebellar inputs and outputs. Zones and microzones in the cerebellum: This schematic illustration of the structure of zones and microzones in the cerebellum shows three levels of magnification. These zones and microzones help explain the modular nature of the cerebellar function. On the left is a simplified illustration of what the cerebellar cortex would look like if all the folds were straightened out—the vertical dimension is the rostro-caudal axis of the cerebellum, the horizontal dimension is the medio-lateral axis. A zone is a longitudinally oriented strip of the cortex, and a microzone is a thin, longitudinally oriented portion of a zone. As the illustration on the right shows, Purkinje cell dendritic trees are flattened in a way that aligns with the microzone length, and parallel fibers cross the microzones at right angles.